Third authorized edition of Don Quixote / Cervantes. When not up to my neck in the world of MusiCB3, I read….a lot…probably far too much (if that’s possible). My current read is a novel that I’ve been meaning to tackle for a very long time – Don Quixote. It’s one of those books where the sheer size can be rather off-putting, but as soon as you start reading, it grabs you and doesn’t let go. So for the last week I’ve spent most of my spare time in early seventeenth-century Spain. Of course there’s plenty of music that has been inspired by Don Quixote too, so where to start? Where better than with Roberto Gerhard? Gerhard was devoted to Don Quixote. His first composition inspired by the novel was composed in 1940 – a ballet that was never produced. Despite interest from, among others, Marie Rambert, it was impossible to find sufficient male dancers in war-time Britain. A suite was then produced from this material in 1941, followed by incidental music for a BBC radio play in 1944. Encouraged by the popularity of the suite, a further symphonic suite was composed in 1947, the same year in which a ballet was commissioned by the Royal Opera House and Sadler’s Wells Ballet. The ballet premiered in 1950. Choreographed by Ninette de Valois, it starred Robert Helpmann as Don Quixote, and Margot Fonteyn as the Don’s beloved Dulcinella. 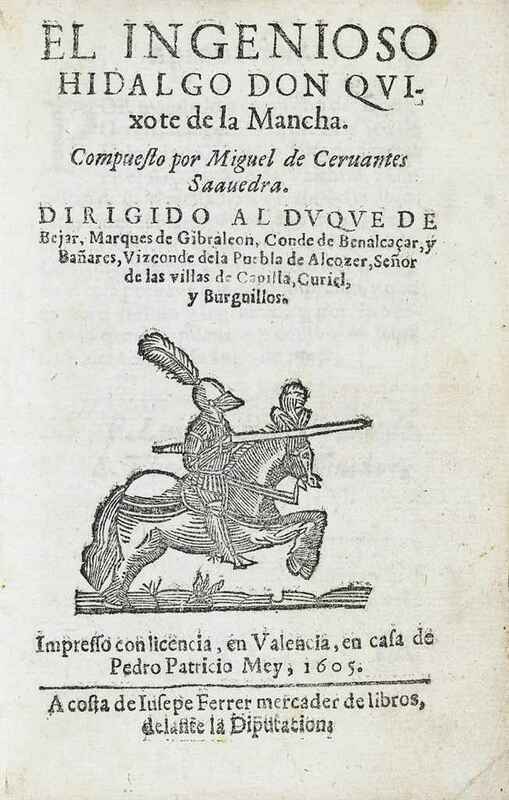 There’s more information about Gerhard’s Don Quixote in The Roberto Gerhard Companion edited by Monty Adkins and Michael Russ (M535.c.201.9). The UL has many of the autograph manuscripts of the various incarnations of Gerhard’s Don Quixote including the autograph of the earliest version of the ballet at MS/Gerhard/4/09, the incidental music to the radio play at MS/Gerhard/3/44, the 2nd (symphonic) suite at MS/Gerhard/3/04, and the later ballet at MS/Gerhard/1/05. We also have printed editions of Dances from Don Quixote (item no. 2 in volume M310.b.95.317), and the 1950 ballet (M310.b.95.303). The earliest full-length film adaptation of the novel with sound was a 1933 production, which (complicatedly) was filmed three times in one year in three different languages using identical sets, costumes and actors. Starring the Russian bass, Feodor Chaliapin, as the Don, it featured songs by Jacques Ibert. Chaliapin had previously created the role of Don Quichotte in Massenet’s opera premiered in 1910. (Ask in the Anderson Room office, if you’d like to see a first edition vocal score complete with cast lists from Paris and Monte-Carlo). From rosy bow’rs / Purcell. Item no. 46 in MR290.b.75.101. 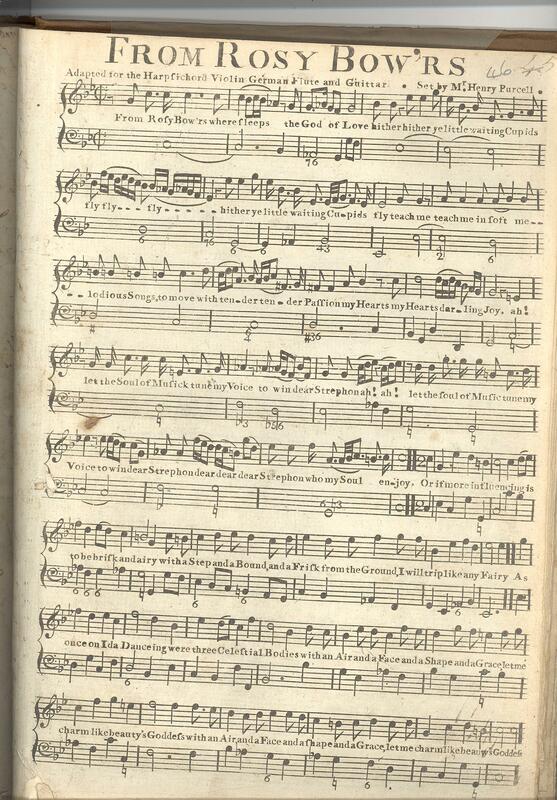 One of the earliest musical incarnations of Don Quixote that we have here at the UL is a song by Purcell, written for Thomas D’Urfey‘s production of Don Quixote in 1694. From rosy bow’rs is item no. 46 in MR290.b.75.101. There are many recent editions too of eighteenth and nineteenth century musical re-imaginings of the novel ranging from well-known names such as Telemann to the lesser known Manuel Garcia, whose opera, Don Chisciotte, was first published for the quatercentenary of the publication of the novel (for vocal score see M260.b.200.47). Countless other composers including Richard Strauss and De Falla have been inspired by the story of the gentle knight-errant. In more modern times Don Quixote has been turned into a Tony-award winnning musical, Man of La Mancha, by Mitch Leigh and Joe Darien, a pop song by Nik Kershaw, a jazz album, and even rap and ska-punk tracks. Meanwhile if you’d like to have a look at the novel, the UL has a third edition from 1605. There’s also the first English translation published in 1612 at Syn.7.61.67. For a more colourful edition, there’s a beautiful early graphic novel with illustrations by Louis Zansky at Waddleton.b.18.495. All of the texts can be ordered from the Rare Books Reading Room, while there is yet more music in the Anderson Room. This entry was posted in Uncategorized and tagged archival collections, music and literature, music at the UL, music manuscripts, Roberto Gerhard. Bookmark the permalink.